Warning labels -- they're ubiquitous. Whether issued by a manufacturer or a government agency, the vast array of warnings is to educate and protect the consumer from the potential risks of a product. Prescription drug warnings about loose stools, leakages, nosebleeds and "erections that may last more than four hours" are repeated daily in TV commercials. Browse through the local supermarket and the consumer is bombarded with warning and cautionary labels on kitty litter, toilet-bowl cleaner and dog biscuits. Movie and television warnings exist to inform the consumer about the suitability of viewing for children and adults. Food and cosmetic labels educate citizens about caloric content, allergens and toxins. Governmental bodies, such as the Federal and Drug Administration (FDA), Department of Transportation, Environmental Protection Agency (EPA) and the U.S. Consumer Protection Safety Commission exist, in part, to protect consumers from products that pose a potential hazard and to regulate standards for such products. The evidence of the lack of sensitivity of mammography for women with dense breast tissue has been accumulating since the early days of the technology. Research for two decades conclude that mammography misses roughly every other cancer in dense breasts. Currently, no national standard or warning exist to educate the consumer about the impact of dense breasts on mammography's accuracy as a screening test for breast cancer. I've been a consumer of mammography since my initial screening exam before the age of 40 and continue to have my yearly mammographic screening as my initial screening test. Weeks before my advanced-stage cancer was detected; I received my 'normal' mammography results. After a palpable ridge was discovered six weeks later during an annual exam, the ridge was invisible on the mammogram but illuminated on the ultrasound. The pathology report revealed that my quarter-size cancer had metastasized to 13 lymph nodes -- a normal mammogram weeks before? Research demonstrates that the stage of cancer at diagnosis, nodal status and grade predict survival. I never knew that the odds of having an early diagnosis because of my extremely dense breasts, despite year after year of mammographic screenings,were extremely low. After the startling and tragic news of my advanced stage breast cancer, I questioned my health care providers as to why my cancer was not detected by mammography. "It is not the standard of care," was the repeated script from my distinguished group of physicians as to why I was not informed of my dense breast tissue and its impact before my advanced cancer diagnosis. Despite the accumulating research about the masking of cancer by mammography in dense breasts and the significant increase in invasive cancer detection by adding a screening ultrasound, it became clear to me that this cautionary information would not be initiated by the medical establishment. The staunch reaction to standardize density reporting to the patient from lobbyists representing physician-trade organizations, women's issues and cancer organizations, is shocking. This lack of disclosure to the consumer and the accumulating research of dense breast tissue and its impact on missed, delayed and advanced cancers compel a warning to women of this critical breast health issue. It is unconscionable to withhold dense breast tissue from the 40 percent of women who have it. Radiologists have been reporting a woman's breast tissue composition in a report that is sent to her referring doctor for more than 20 years. These eleven years of reporting my mammography results, which were never shared with me, indicated that I had extremely dense breast tissue which lowers the sensitivity of the mammogram. This information was not included in my "happy gram" mammography results nor did any of my health care providers, in the 11 years preceding my diagnosis, educate me on the impact of my dense tissue on the reliability of my screening mammogram. This lack of information harms patients and puts women at a greater risk of dying prematurely from this disease. Connecticut was the first state in the nation to require density reporting through the mammography report, in addition to insurance coverage of adjunct ultrasound and MRI screening. Data as a direct result of our cautionary label of dense breasts have resulted in nearly the doubling of invasive cancer in the general population. This notification precedes an informed conversation. Congress and the FDA have the opportunity to protect the consumer from missed, delayed and later stage cancers by creating a national standard of warning women of its risks and screening challenges. Caution: dense breasts! For information about state, federal and regulatory efforts visit Are You Dense Advocacy Inc.
1. 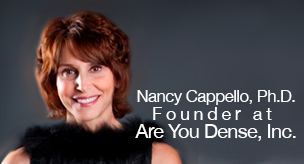 Cappello, N. Decade of 'Normal' Mammography Reports-The Happygram. Journal of the American College of Radiology 2013; 10:903-908.